The Titleist AP1 716 irons are designed with tour proven technology, appeal to a wide range of golfers and are the most playable and forgiving iron that Titleist produces. They feature maximum distance from the 360° undercut cavity which creates a thin, fast face for an increase in both speed and launch. The high density tungsten weighting plays a dual role in the AP1 716 by offering maximum forgiveness and even more distance. The use of the tungsten moves weight to the perimeter increasing MOI for speed on off center hits offering more forgiveness. It creates more distance by lowering the CG and allowing for stronger lofts to create even more speed and distance. 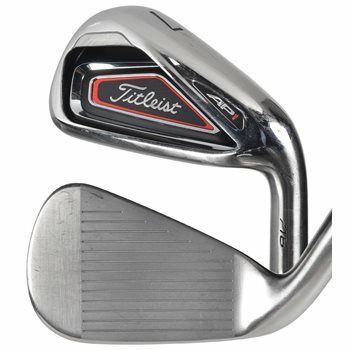 The Titleist AP1 716 irons are the longest and most forgiving Titleist iron ever. Review by WLS, 2 years ago. Review by Wayne, 2 months ago. Review by Maverick, 1 year ago. Review by Brady B, 1 year ago. Review by Sean, 1 year ago. Unfortunately there is not a way for us to list the size and type of grip on the clubs available for purchase. The clubs are pre-boxed and we ship from multiple locations. We could also have more than one of the same exact item. Our shipping department will simply pick the item on top and process the shipment. Is the ap1 sold as 6 thru pw. What is your return policy? Is it written anywhere that I can review? what about the question? What is your return policy? Is it available for review? Can I have the lie adjusted? We do not offer lie adjustment services but you may be able to have it done at a local shop. I would suggest checking with them first. Titleist does not list an AW for this set. They list W and W2 The W2 has 52 on the sole for the pitch. Which one is included in the 4-PW, AW set currently listed? It would be the 47 degree "W"
How old are these clubs? The 716 series was introduced in 2016. If you look at the top of the screen, to the left of "Help/Chat", there will be a flag representing the county whose currency is being shown. If it is a US flag, you are seeing US dollars. You can click the arrow next to the flag to change to any currency you are looking for. P: 43 degrees, W: 47 degrees, W2: 52 degrees.